Recently upgraded my entire entertainment system and since I was spending some serious cash on it, I wanted or should I say needed some serious cabling, after doing my usual intensive research, I came across Cable Chick and found everything I was after and more, plus the prices and quality of there stuff was unbeatable, service was super quick and friendly, definitely recommend Cable Chick to anyone looking for a quality online service. Now you can read Blu-Ray, DVDs and CDs, and Write DVD-R/RW + CD-R/RW while on the go! Plays Blu-Rays, DVDs and CDs and can write to blank DVDs and CDs. Complete your mobile empire by complementing your super-slim Ultrabook or PC with this USB 3.0 external Blu-Ray Optical Drive, featuring the ability to also read & write DVD and CD formats*. By far the most appealing feature of this device is playing back movies on your computer, whether it be a desktop, laptop, ultra-portable or macbook - as long as you have the software to decode Blu-ray discs (more on that later) this little plug-and-play optical disc drive will stand you in good stead. All you need is an available USB 3.0 socket for data, and a second USB 2.0 or 3.0 socket for power, and you will have a fully functional optical reader and burner. It has plug and play functionality for Windows XP, Vista, 7, 8, 8.1 and Windows 10, plus we tested in on Mac and it works there, too! It works just the same as a normal disc drive, except you can take this one with you. It will slip easily into any laptop bag and the included data and power cables won't take up much room either. *Blu-ray Decoding and DVD/CD Burning Software is not included with this device, but many premium and free options are available. We tested Blu-ray playback with the popular Leawo Blu-Ray/DVD/Video Player app with great success under Windows 8.1 and 10 and OSX. 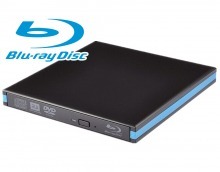 Note: Blu-ray playback isn't well supported on computers, even a decade after its invention, so not all discs are suitable for playback, and each software solution has its strengths and weaknesses. For help understanding the limitations of this product, please don't hesitate to Ask a Cable Chick Expert. Answer: "This device does not output directly to a TV or projector. It must connect to a computer via USB and operate as an optical disc drive. Inside the computer operating system, the region may be changed a limited number of times. This device has only been tested with Australian Region B discs under Windows. No configuration was required." We received our order in a timely and seamless manner. This is the second time we've used Cable Chick to purchase a heavy duty wall bracket to suspend a TV and have had excellent service.